Deutsche Hanse or, in Latin, Hansa Teutonica, are alternative names for the Hanseatic League, an alliance between merchant guilds and (later) between cities originating from lower Germany. Cities that joined the League were called Hansa cities. The League emerged (rather than being explicitly founded) in the middle of the 12th century. Since there was no formal application to join until the later half of 14th century, it was impossible to tell which cities belonged to the League during this period. It was believed, however, that almost 200 cities were involved in some capacity with the League. Players attempt to increase their standing as merchants in the Hanseatic League by gaining prestige points. This may be done in different ways: Establishing a network of Counting Offices in new Hansa cities may be as promising as improving trading skills. Players accomplish various activities during their moves. Traders may be inserted on the gameboard, moved, or even displace traders of other players. If they eventually occupy an entire trade route between two cities, a new Counting Office may be established. But players may also develop their trading skills, instead in particular cities, improving their abilities throughout the course of play. The winner of the game is the player who gains the most Prestige Points. Hansa Teutonica is the type of game I think of when I hear the term “Euro-game”. It’s low-luck, cube pushing excitement emphasizing strategy and tactics over theme, with a touch of player interaction, and multiple paths to victory, all rolled into a great 60-75 minute package. The game scales well with different player numbers, including a dual sided board: 2-3 players on one side, 4-5 players on the other. You’re attempting to increase your standing as a merchant in the Hanseatic League (or so says the rules), but in typical Euro-game fashion, you’re aiming for the most victory points. You’re going to do this by improving your standing in five abilities. In addition, you’re claiming trade routes, influence (offices) in towns, and getting in the way of your opponents doing the same. Much of the game will consist of placing cubes/disks on trade paths. Most paths have room for 3 pieces, with some that hold 2 or 4. It takes one action to place a cube/disk. These paths are bounded by cities. If you fill a path with only your cubes/disks, you can spend an action to “score” the path. Generally this will allow you to place a cube/disk in one of the surrounding cities (as an office), if you have a high enough Privilege for the city (denoted by different colors). Having the most offices in a city (or highest ranking if tied) will score a player a point anytime a route adjacent to it is scored. There are five cites on the board that allow you to, instead of taking an office, increase a specific ability on your player board. You take a cube/disk from the board from the corresponding ability. (A sixth city allows you to exploit your place on the Privilege track to grab end of game points with one of your disks). Additionally, claiming some routes will give you a Bonus Marker, which allows for extra abilities, depending on marker type. There are three on the board each turn, which remain until taken, and are then replaced. The bottom of your player board shows what you may use actions for. -Move a number of pieces from general to personal supply based on Money Bag value. -Displace an opponent’s cube/disk from a route, taking the spot for yourself (requires an extra cube, or two if displacing a disk, and allows opponent to move their cube to an adjacent route, along with an extra cube). -There are no Bonus Markers left to re-fill the board to 3. You’re playing the game to have the most points. You’ll be gaining points during the game, primarily through having the majority in a city adjacent to a scored trade route (1 each). You can also gain 7 points by connecting two specific cities with a chain of offices. The cities in the corner of the board also have a single office spot that gives a point to the person that claims it. -Bonus Markers, if you claimed bonus markers, you’ll gain points based on how many you have, with an escalation similar to Coloretto. -Points for the “sixth” city mentioned above, if you placed a disk during the game. The blocking/displacing mechanic is well done in the game. You can never completely ruin an opponent’s game (or have yours ruined) by blocking a spot. The opponent has to decide if it’s worth an extra cube to bump you off. Since you gain an extra cube on the board each time you’re bumped, it’s generally to your advantage to get in your opponents’ way. It doesn’t feel malicious when someone does this, as everyone has an equal ability to return the favor. I prefer the game with 4 or 5 over 3 (though I have not yet played the 2-player game which adds a few extra rules). The Z-Man edition rulebook clears up many of the confusions that came in the English translations from the earlier Argentum Verlag and 999 Games editions. There is a great ratio of decision making to play time. There are few games on my shelf that require you to change tactics and adapt as often as Hansa Teutonica, all while playing in under 90 minutes. The rules and possible actions are rather straightforward, once you’ve played a few rounds. Hansa Teutonica is not a deep brain-burner like Age of Steam or Dominant Species tends to be, but still has great depth and replayability. There’s already an expansion map, for those that want to change up their game play. Hansa Teutonica is great for pure Euro-gaming enthusiasts. I highly recommend giving it a try! The Hanseatic League (aka Hansa Teutonica) was a medieval alliance between merchant guilds of cities in lower Germany which expanded into the North and Baltic Sea areas. In Hansa Teutonica, players take on the role of merchants seeking to increase their standing with the League. Like many Euros, the theme is not well represented in the game. The object of the game is to establish counting offices along trade routes and improve your trading skills to score the most Prestige Points (PP). Hansa Teutonica plays with 2 to 5 players, however; I would recommend this game for 4 or 5 players. The components are very good. The mounted board is colorful and very pleasing to the eye. There are thick cardboard chits & player mats, and wood playing pieces. No trouble discerning player colors here. The rulebook is my one complaint with the components. It is only 10 pages and has examples of play, but could have been organized better, and the English translation makes several rules unclear. Set-up for Hansa Teutonica is quick and easy. Each player chooses a color and fills the abilities on their board with cubes. The player board represents his desk in his headquarters and indicates the player’s current abilities. Each player places a disc on the Prestige track. Players also set up their personal Supply consisting of merchants (discs) and traders (cubes) according to turn order (the starting player has the smallest starting Supply and the last player has the largest starting Supply). The 3 gold bonus markers are randomly placed on the board at one of the taverns. The player moves the number of traders and/or merchants indicated by his Money Bag ability from his Stock to his Supply. The Stock is a pool of pieces out of play and the Supply is a pool of pieces ready for immediate use. A player places one trader or merchant from his Supply onto a vacant house along a route on the board. The board depicts cities with trade routes connecting them. Along the trade routes are houses. a. A player may displace another player’s trader at a house along any route. The player must also move a trader or merchant from his Supply to his Stock. The displaced player then places his displaced trader plus one trader or merchant from his Stock on houses in an adjacent route. b. A player may displace another player’s merchant at a house along any route. The player must also move any combination of two traders/merchants from his Supply to his Stock. The displaced player then places his displaced merchant plus any combination of two traders/merchants from his Stock on houses in an adjacent route. A player can move a number of traders and/or merchants already on the board equal to their Book ability to other vacant houses along any route. When a player fills all the houses along a route between two cities he may claim the route. He removes all traders and/or merchants in the houses and may place one in an empty office in either city adjacent to the route. The player also takes any bonus markers along the route and/or scores a PP for any existing offices in the adjacent cities. Bonus markers grant additional actions or abilities. Any bonus markers picked up during a turn are replenished at the end of the player’s turn. Instead of establishing an office in an adjacent city, the player may improve the indicated ability. When one of the three endgame conditions is triggered, the game ends and PPs are then tallied to determine a winner. Players receive PPs for fully developed abilities, bonus markers, controlled cities and the largest chain of cities. The winner is the player with the most PPs. Hansa Teutonica takes a few plays to master the rules and strategies. It is a heavy game and I would not recommend it to casual gamers. Hansa Teutonica is not like most Euros as it does not use a typical worker placement mechanic and does not ask players to collect resources and turn them into something else. In addition, it has direct conflict and heavy player interaction! Most Eurogamers are not used to direct conflict and even avoid games which have it. I have seen many players hesitate to use the Displace Another Player Action which is unfortunate as this is the heart of the game. Conflict is softened somewhat in Hansa Teutonica making it easy to handle for those on the receiving end. Hansa Teutonica isn’t very thematic, and can feel like a cube pusher for those who like theme in their games. Game time is anywhere from 1.5 to 2 hours with little downtime between turns. Players are engaged in play even when it’s not their turn so the time goes quick. Hansa Teutonica is a unique Eurogame and would be a good addition to your collection. I really love how this game has very little randomness (only the dinner plates) but still has a lot of replayability. The game length is also determined by players and you have to adapt your strategy if you notice other players are trying to trigger endgame. I like playing with the objective cards from the expansion, but not the new map. The only bad thing I have to say is that a new player may cause the experience to be less fair for other players. After 3 plays this is one of the best euro games i have played, not just this year, but ever. It’s certainly on par with Puerto Rico and Caylus. It plays fast (i.e. 60mins) and i have played it with a relatively slow group and the time is indeed accurate. So you can easily play two very satisfying games back to back in one night. Also the individual turns are quick because players don’t have that many actions/activities to do. So, you have enough time to plan your turn but not too much downtime. There are so many ways to play and win this game. Just messing around with the different strategies is fun in it’s own right. This is something i don’t see very often. Of course that could change once we play it some more. The mechanics are not complicated. Although there are many ways to score points, in fact we made a few mistakes when we played it, it’s easy to understand once you have a few games under your belt. I was in a hurry when i read the rules of Hansa Teutonica and i did not explain it as well as i would have liked. However, i think this game can be taught to more casual gamers who are up for something more challenging. It plays very well with 4 (which is the number i played it with) and I’ve heard that it’s best with 5. 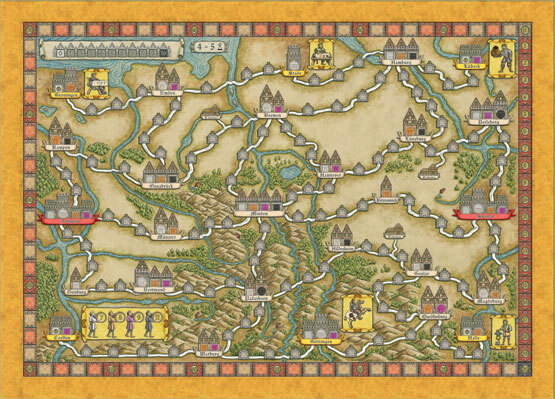 At first glance, Hansa Teutonica is a simple territory control and resource management game, but a turn or two into your first game you start to see devious options appear on the reverse tech-track system. Your resources slowly grow as you build your tech, which opens up more options, and need for resources. What appears to be a basic territory race turns into a bluffing game where you try to trick opponents into committing resources into actions they don’t want while hiding your own true goals. Getting in the way of your opponents is sometimes the best way to get what you really want, but are you falling for the same trap? Dominating territory can be a fast way to end the game before opponents can get their tech-engines running. Then you discover your territory routes are cut off by another opponent who has quietly been playing politics with the local nobles. And you thought this was only about controlling trade routes? Add a Review for "Hansa Teutonica"